After discussing idea for years, Hillsboro cops begin to use body cameras while on duty. Smile, Hillsboro. You're on camera. Body-worn cameras are now officially part of the uniform for most police officers and sergeants in the Hillsboro Police Department. By the end of next month, officials estimate, all patrol, traffic, transit and K9 officers and sergeants should be wearing the cameras, including school resource officers stationed in the Hillsboro School District. It's been more than two years since the Hillsboro Police Department first began discussing the idea of wearing body-worn cameras. The city received $217,500 from the U.S. Department of Justice as part of a push by the Obama administration to add body cameras to police departments across the country after several high-profile police shootings across the country. "It's not a cure-all," said Hillsboro Police Chief Lee Dobrowolski. "It only gets one perspective, but at least it's a perspective where sometimes there might not be one. It's actual documentation." Dobrowolski said the cameras will help with transparency and accountability for police, as well as the public. "That accountability actually goes both ways," Dobrowolski said. "It's us being accountable to the public but also us capturing us when we do it right, and I really think that's the vast majority of what we are going to capture, is our officers doing it right, because I think they do a great job on a daily basis." A 2015 study by the University of Florida found that officers with body cameras are 53 percent less likely to be involved in "use of force" incidents and are 65 percent less likely to have civilian complaints filed against them. "We actually are very fortunate we have a good relationship with the community, so I think bringing the cameras online continues to build on that public trust," said Hillsboro Police spokesman Lt. Henry Reimann "(It is) also helping with the transparency of legitimacy in policing. I think the big thing for us is we are fortunate that we have public trust, but to continue to build on that public trust in Hillsboro." Most officers will wear the cameras on their shoulder, but the tiny cameras can also be attached to eye-glasses, Reimann said. The camera automatically begins filming when an officer switches the lights on in their police car, or when an officer's Taser is turned on, he said. In some cases, officers will need to turn them on manually. They also pre-record 30 seconds before they are turned on. "I think it really goes towards transparency," said Hillsboro Police Commander John Schmerber. "Transparency to the public on what we are doing, how we are doing it. It goes towards good investigations with regard to tracking and monitoring what we are saying and being able to accurately document what we are doing out there." The video footage is automatically saved and sent to a city server for record keeping. Officers can view their own camera footage from an application on their phone, but cannot delete or edit the footage in any way, Reimann said. The footage is stored for a minimum of three months, and footage involving a crime or to be used for investigation will remain in the server for much longer. "It's going to be helpful in the long run I think," said HPD officer Matt Delepine. "For court proceedings it's nice because it's not just our word against someone else. You can just play the video and let it sort of speak for itself on some of those things. … I think it keeps people on their best behavior, so if someone was maybe thinking about doing something, it might change their behavior just knowing that it's being recorded. … I think it's just an added layer." 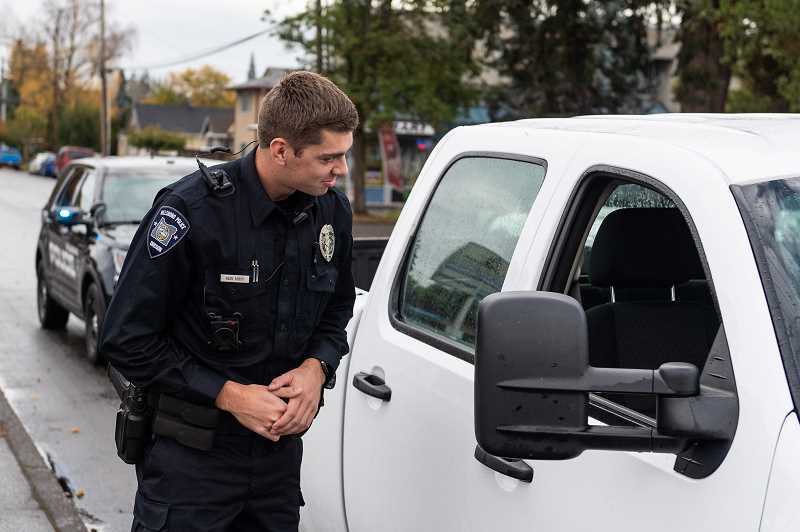 So far, about three-quarters of Hillsboro's sergeants and officers have been trained to use the cameras, some of the last to get on board will be school resource officers in the Hillsboro School District. 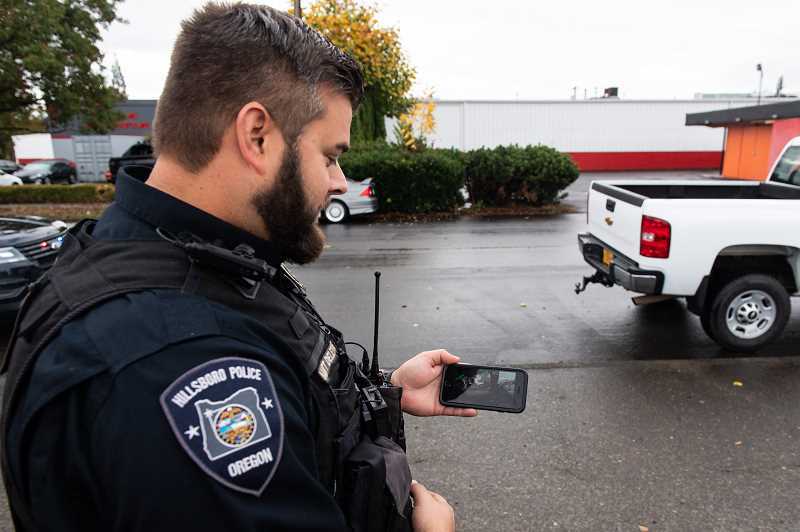 Casey Waletich, Hillsboro School District's chief operations officer, said the district supports officers in the classrooms using the body worn cameras while conducting investigations. "We are fully supportive of the use of body worn cameras by all officers, including those who work in our schools," Waletich said. "Our school resource officers create relationships and serve our students in many ways, and we don't believe body worn cameras will impact those interactions." The process to implement the cameras across Hillsboro hasn't been short. Reimann said the city has been thinking about bringing body-worn cameras to Hillsboro officers for the past few years. "There were a lot of steps into making sure we do it the right way," he said. "And we definitely made sure that we crossed all the T's and dotted all the I's and that's why even with the implementation, we are kind of doing it in segments in case there are lessons (to be) learned." When the process of implementing cameras started several years ago, Dobrowolski and other members of the police department held public forums and launched online surveys to receive public feedback about how they would like to see the devices used before creating a policy. "We did our best to engage the community on this, and give the community an opportunity to give us input, and their input weighed heavily in how we developed our policy," Dobrowolski said. "And our policy and procedure of how we are using the cameras, or how we are going to use the cameras in the future, was based on their expectations, and so I think moving forward that they will be happy with the way it goes because they had input." Dobrowolski said while officers have only been wearing the cameras for a week or two, the feedback among officers and the community has been positive. "I actually had an officer walk into my office yesterday and thank me that we have the camera because of an incident that had occurred where he was so happy that it was on video," he said. "I think that our officers, because we have been talking about this for so long, they've known it's coming and I never at any point got (negative) feedback from them. I think that they, just like the public, had an expectation that it was inevitable. "Just like every other thing in law enforcement, as it changes, let's absorb it into our culture and the way we do business and move on," he added.